A 19th-century description of Bosworth Field that is definitely pro-Richard….! I have copied the text as faithfully as I can, omitting passages that do not belong in the main description of the battle, and do not anyway concern Richard. The spelling is dodgy at times, and I have left most of it alone. There is also the question of some optical recognition software bloopers. I have corrected those which I feel certain are wrong (and for which I could easily guess what was meant) but there are a few that defied me. If I have blundered, I apologise, and can only say that my sins will be corrected by a visit to the website. The illustrations are my decorations. Anyway, here is the section of the book that deals with Richard’s final battle. It commences at the Blue Boar inn, Leicester. . . .On the following morning, as early as day-break, the streets rung with the preparations for an hasty march. The braying of trumpets, the hoarse shouting of the military leaders, the jingle of equipments, and the fierce trampling of caparisoned steeds, startled sleep from the pillows of those, whom the dissolute soldiery, overcome with intoxication, had eventually left to the enjoyment of a brief repose. His highness appeared in unusual health and spirits, and mounted on his gallant charger, rode swiftly up and down the lines, inspiriting his army and animating his chieftains with uncontrollable enthusiasm. A bright sun and a smart, lively, breeze contributed in no small degree to the hilarity of every one present, and among that vast and glittering assemblage who were shortly to embark in stern and deadly strife, it would have been perhaps impossible to have detected one lugubrious or even thoughtful aspect. The ancient street of the High Cross, so far as the eye could stretch, bristled with staves, bows, and the various implements of ancient warfare, which with the morions and breast-plates of their bearers, glittered fiercely in the sun, while every window, roof and balustrade of the huge picturesque buildings, swarmed with spectators, and oft, as the cavalcade moved slowly along, a fair white hand, bearing a floral wreath, a silken scarf or some gentle love-token, was protruded from a crowd of gazers and reverently received on the lifted lance of the devoted Cavalier. A company of Knights, gorgeously apparelled, rode forward down the narrow Lane, now called Simons’ street, and past Saint Nicholas Church towards the West Bridge. Among them was his Highness, distinguished no less by his kingly bearing, than his costly attire, which so blazed with gems, that it dazzled the eye of the spectator almost as much as looking on the sun. Their hot impetuous steeds champed eagerly on the bit, and curvetted along in the utmost impatience of activity and vigour. The monarch relaxed from his usual austerity, and his aspect, which was at all times noble, and was capable of assuming an expression even of the most endearing tenderness, wreathed itself in smiles, and fired the hearts of those around him with the most enthusiastic devotion, and adherence to his cause. On approaching Bow bridge which spans with five arches another arm of the river Soar. . . a. . .decrepid old woman stood conspicuous among the dense crowd which everywhere lined the path, and was shaking. . .violently with palsy. Her eye, which seemed to fix itself upon the king, gleamed with. . .apparent malignity. . .The Monarch appeared to regard all alike with smiles, but in crossing the bridge, partly perhaps from an exuberance of feeling no less than from the impatience natural to an impetuous spirit in being compelled to brook a temporary obstruction, created by the compact multitude and the narrowness of the path, struck his spur against the coping thereof. His horse swerving aside, pressed so closely upon the spectators, among whom crouched the old prophetess, that a volley of shrieks arose, and the afrighted crowd rushed tumultuously into the middle of the path, threatening every moment to be trampled under the hoofs of the horses. The old Sibyl, however, stood daringly forth and stretching her withered arm in the face of the Monarch, screamed out in a startling treble which seemed incredible for her years, the following terrible prediction. “Brave as ye now seem; tricked out daintily as ye are; the hour is at hand when ye shall be fain to change that joyous face for mourning and repentance! That gay attire for sack-cloth! Ye have spurned that stone with your heel—against it, ere three days be past, shall your head be beaten. Vain king, beware!” The toothless hag, overcome with her unwonted exertion, fell back among the crowd; and the monarch struck spurs into his horse, and rode on. Bosworth Field is situate on the western border of Leicestershire, and derives its name from the market town, from which it is one mile distant. Its proper name is Redmoor plain, from the colour of the soil; as the meadows on the west, are called Whitemoors, for the same reason. It belongs to Sutton Cheney, an adjacent village on the east, is of an oval form, about two miles long and one broad, and runs nearly in a line between Bosworth and Atherstone. The south end, where the Earl (Tudor is called Earl of Richmond throughout) approached, is three miles from Bosworth, and is now covered with a wood of some extent, and bounded by a narrow rivulet called the Tweed. 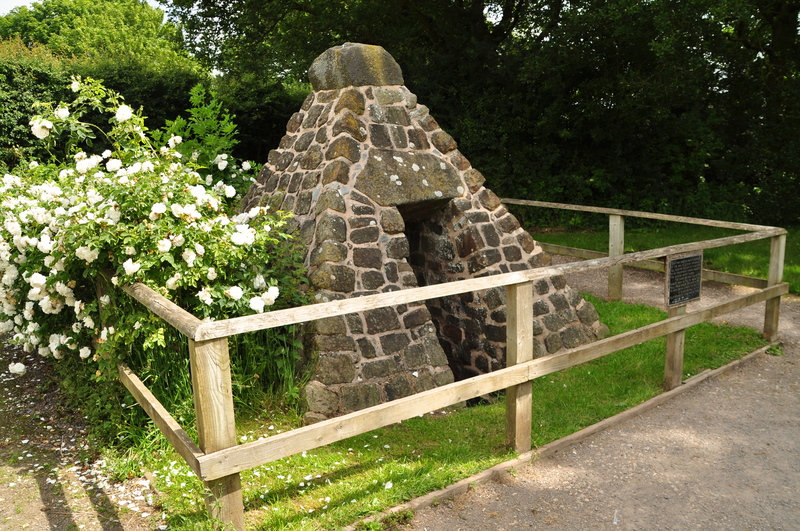 About thirty yards above this wood, is a spring which bears the name of ‘King Richard’s well,’ at the present day. A small stream of water flows from it in the direction of the Tweed; but, having no regular channel cut for its passage, it penetrates into the soil and forms a morass, which Henry is said to have left on his right. 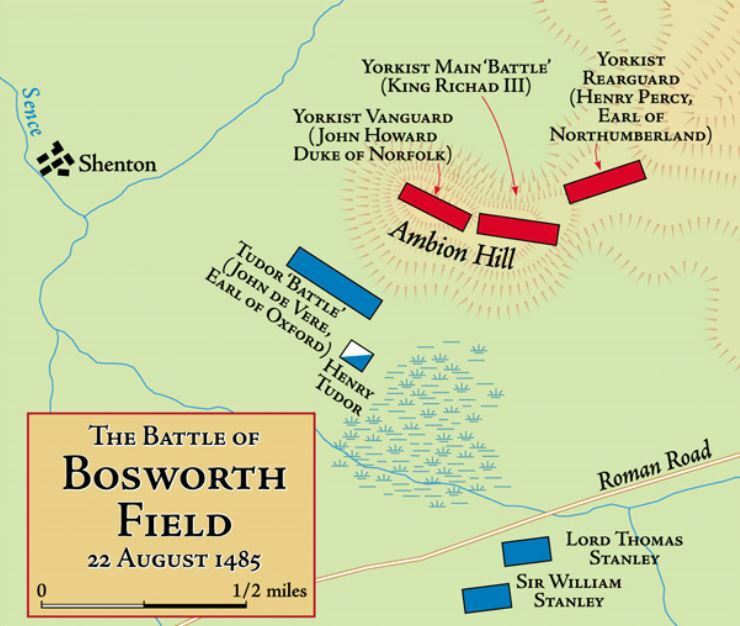 Amyon Hill, the scene of action, is nearly in the centre of the field, and has a steep descent on every side; but is steepest towards the north, or Bosworth side; and terminates with a rill, a bog, and a flat, called Amyon-leys. The country, however, at the period of the battle, presented an appearance widely different to that which it wears at the present time. The adjacent Lordships were then uninclosed, and Bosworth Field was one extent of rough uncultivated land. Towards evening the King’s forces advanced upon Bosworth, where the Earl of Richmond’s army was also beheld approaching in gallant style: onward they came, flashing the red light of the descending sun from their steel equipments, and frowning mutual defiance at each other. Phalanx after phalanx of compact lances hove in sight, diversified with the vari-coloured plumes and pennons of the knights, until the country around presented no other aspect. Richard galloped into the plain, and looking frowningly around, his penetration immediately led him to suspect that treachery was meditated. Lord Stanley, whose sincerity he had long had occasion to doubt, remained stationed, with an army of five thousand men, on an eminence termed Gamble’s close, about six furlongs behind the royal camp, from which it was separated by the little rivulet above mentioned. Sir William Stanley, approached the field on the west, opposite to the King and Lord Stanley, and pitched his camp at the foot of Amyon hill. It was the policy of the two brothers, to preserve every appearance of faith towards Richard, while they were both at heart devoted to the cause of his antagonist; and, as the wily monarch detained Lord Strange, as hostage for his father’s fidelity, the appearance on the part of Lord Stanley, was more strictly preserved. King despatched Sir Robert Brackenbury, with a brief, but terrible message, to Lord Stanley, commanding him to join him forthwith, if he desired to preserve his son’s life; to which he returned a prevaricating reply: and the King was only withheld by the firmness of Lord Ferrers, of Chartley, from putting his threat into immediate execution; that nobleman having represented to him the evil, which might ensue to his own cause, by so doing. The Earl of Richmond, meanwhile was not slow to gain over to his party all such, as were accessible either to adulation or bribery; and, observing the indecision of Lord Stanley, whose services he earnestly wished to secure from a dread of disappointment, immediately turned it to his advantage. A message was despatched to that nobleman forthwith, requesting his assistance, in the most flattering terms ; to which, however, he returned a doubtful reply; but intimated, that he should, probably, be found when needed. With this answer, the Earl, though much displeased was, notwithstanding, compelled to be satisfied, and left it to chance, to operate in his favour. Meanwhile, as the shadows of twilight were rapidly closing around, the armies prepared to encamp; Richard, taking up his position at Stapleton, on some elevated grounds, called the Bradshaws, situate about a mile and a half east of Bosworth Field, and two from the top of Amyon hill—while Richmond stationed himself on the Whitemoors, one mile from the top of Amyon hill, and close beside the rivulet, whose semi-circular course skirted the camps of the rival chiefs, and passed near to those of the Stanleys, which fronted each other. . .
. . .The morning broke heavily over the plains of Bosworth, as if it mourned the carnage, that was about to ensue. The distance was veiled in a drizzling mist, through which, the adjacent trees, presented all manner of fantastic forms. The tents looked moist and chill, and the silken banners which surmounted them, rich with the gorgeous blazonry of their respective owners, hung heavily around their staffs, saturated with the prevailing vapour; while the steel equipments of horses and riders, shone dimly through the haze. With the first peep of dawn, however, the adverse camps were alive with preparation for the approaching conflict, and long ere the sun looked out from the watery east, the rival chieftains, had each drawn out his army. The king’s troops were commanded to rendezvous in Sutton field, about midway to Amyon hill, where they were drawn up in order of battle, to the amount of about twelve thousand, horse and foot; thus nearly doubling the force of the enemy. His right extended to a declivity on the Bosworth side, called Cornhni furze, or Amyon leys; and his left towards the well which bears his name. Richmond took up his position with less advantage, having the hill against him, up which he must march, before he could commence the attack. Sir William Stanley advanced to the north of the hill, and stationed himself near Amyon leys, and Lord Stanley flanked either army on the opposite side. In order to strike the more terror into his foes, the King marshalled his soldiers in two extended lines, placing the archers in front, and the bill-men in the rear, while his horse were divided upon the right and left wing. The King’s chief commanders were, John, Duke of Norfolk, and his son, Thomas, Earl of Surrey, who were appointed to lead the van, the Lord Northumberland, Sir Richard Ratcliffe, Sir Robert Brackenbury, and others. 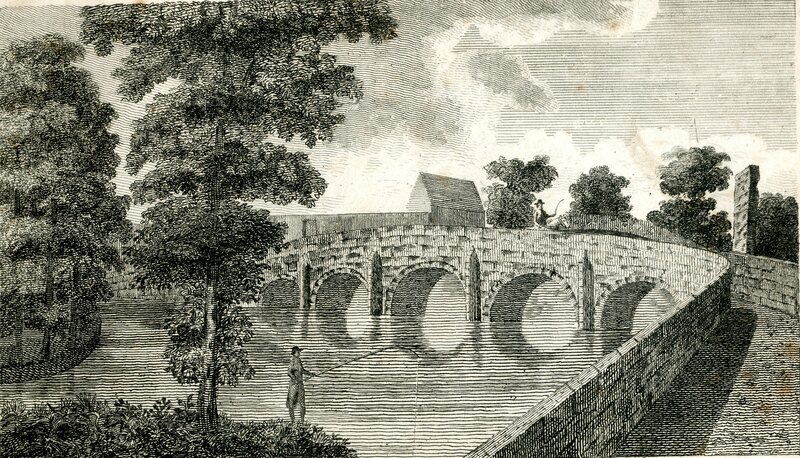 Hungerford and Boucher, two knights who had been ordered to attend, deserted Brackenbury their leader, a little beyond Stony Stratford, and joined Richmond’s army near Tamworth. Sir John Savage, Sir Bryan Sandford, Sir Simon Digby, also deserted to Richmond on the following day. 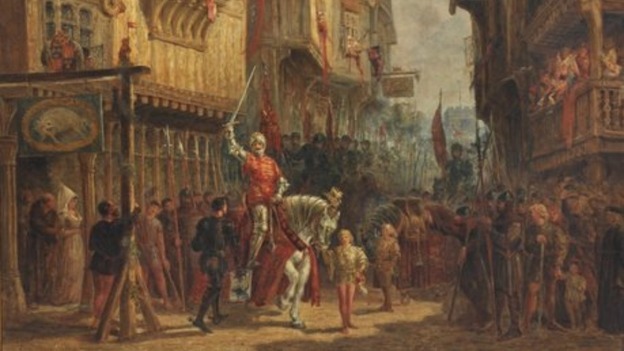 His forces being thus arrayed, the King, attired in a suit of armour of polished steel, and wearing on his head a helmet, of costly workmanship, surmounted with the crown, according to the ancient practice of knighthood, addressed them in a hasty speech against Richmond, whom he plentifully loaded with opprobrium. 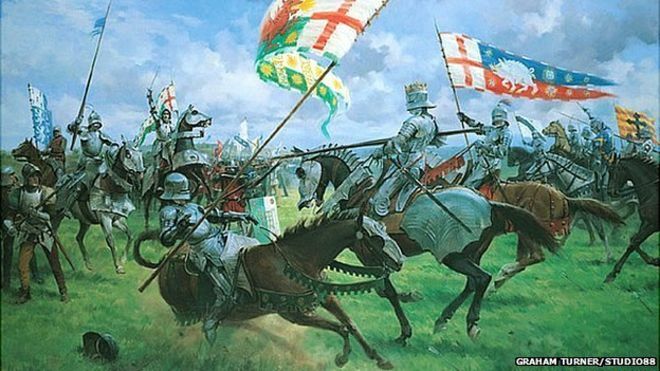 The Earl’s forces, consisting of about seven thousand, horse and foot, were arrayed in similar order; and were led by the Earls of Pembroke and Oxford, Sir Gilbert Talbot, and Sir John Savage, commanding the right and left wing of horse; and not to be behind hand with his antagonist, the Earl galloped up and down the line, encouraging his followers and vituperating the King, whom he denounced as a tyrant and homicide. The trumpets rang forth tumultuously—and the rival armies rushed at once to the onset. A cloud of arrows for a moment darkened the air; and immediately a grove of spears came splintering upon cuirass and morion, some transfixing, and overturning others, who in a moment were trampled out of existence, beneath the hoofs of the raging steeds. Fiercer every moment grew the affray, and for a length of time, the fortunes of the day hung wavering in the balance. The King rushed through the fight, with the impetuosity of an enraged lion, hewing a purple path through the thickest of the enemy, who fell before him, with scarcely an effort at resistance, so utterly reckless and terrible, was his daring. During the heat of the conflict, the Earl of Oxford, observing his line scattered, ordered every man to close upon the standard, a step which seemed imprudent at the time, but had for its object a deep laid scheme, which had been previously planned. Thus having shortened his ranks by condensing his men, the Earl was approached by the Duke of Norfolk, who extended his left to surround him; in which critical moment. Lord Stanley, from flanking both armies, joined Richmond on the right and faced Richard’s left; thus preventing the meditated destruction, and striking terror into the hearts of the Royalists. Norfolk, beheld the starry ensign of Oxford, waving above the bristling phalanx, and rushed to attack him, spear in rest: the ties of relationship were in a moment forgotten, and they strove against each other, with the fury and desperation of long engendered hate Their spears were quickly shivered to pieces, when each drew his mighty two-hand sword, and Norfolk, aiming the first blow, smote furiously at the helmet of his adversary, from which the weapon glanced obliquely, and wounded him severely, in the left arm. Oxford clove the beaver from the casque of his antagonist, and honourably declining to follow up his advantage, abandoned the combat. He had not retired many paces, however, when, the Duke was struck in the face, by an arrow, which pierced his brain. . .
“Talbot! Saint George, for England! Down with the friends of the usurper!” echoed among the belligerents, who fought against each other with the desperation of wolves. . .
. . .Sword and dagger were speedily shivered in the melée , when they fastened on each other by the throat, or wherever else they could lay their hands, and tumbling from their saddles, were trampled beneath the hoofs of their own steeds. The Earl, intent on revenging the death of his father the Duke of Norfolk, fought with reckless courage, and approaching the veteran Sir Gilbert Talbot, engaged with him hand to hand. Overpowered, however by numbers, his strength was beginning to fail, when Sir Richard Clarendon, and Sir William Conyers, raised the war cry of the Earl, and spurred in to his rescue—which was again cut off by Sir John Savage, who waving his sword around him, already drenched with blood, encompassed them with a party of his followers, when they were immediately cut to pieces, and the Earl taken prisoner. . .
. . .The battle had now lasted above an hour. The advantage was on the side of Richmond, Richard having lost his two principal officers; when a scout came upon the full run, and informed the King, that Richmond was at hand with a slight attendance. It was the opportunity for which the Monarch had thirsted throughout the day, and bidding those, who accounted themselves true knights, to attend him, he waited not for reply, but striking spurs, into the flanks of his gallant steed, rushed to the spot, and threw himself with irresistible force, upon his detested enemy. Sir William Brandon, the Earl’s standard bearer, was the first whom he approached, and tearing the lordly ensign of Cadwallador from his grasp, he hurled it beneath the hoofs of his steed, and with one stroke of his sword, clove the head of the unfortunate knight in twain. Sir John Cheney, a powerful warrior, and several others were unhorsed, after a feeble resistance; and the Earl, himself, quailed before the sword of the avenger, while his army stood paralyzed at the extraordinary daring. At this juncture. Sir William Stanley, who had hitherto remained neutral, joined the Earl, with an army of three thousand men, which immediately turned the fortunes of the day. The King’s chief commanders had already fallen. Most of his forces composing the rear, amounting to nearly three thousand men, placed under the command of the Earl of Northumberland, grounded their arms, and nearly all his followers, now abandoned his cause, leaving him to terminate his career of matchless valour. His intrepid spirit, notwithstanding the terrifying odds, still sought, through the thickest of his foes, the contender for his crown; and plunging recklessly forward, madly contending against a whole army, was brutally hacked to pieces by the Earl’s followers; who, whilst he was expiring on the ground, plunged their swords and daggers into his body. Thus perished Richard the third, than whom a braver warrior and more politic king, perhaps, never existed. Prompted by ambition, his ruling passion, his Machiavelian subtlety led him through a terrible career of crime, to achieve and maintain his title to the crown. Thus his character, though it presents nothing absolutely despicable, will ever be contemplated with terror and abhorrence. In this battle, which lasted little better than two hours, it is estimated that upwards of one thousand persons were slain on the side of Richard; and about one hundred, on that of Richmond. But, the chief part of Richard’s army, it appears, never struck a blow; the foulest treachery was employed by his officers, more especially by the Earl of Northumberland; and the Stanleys having joined his enemy with their important additions, sufficiently accounts for the loss of the battle. At the end of the conflict, the loss of Richard, did not greatly exceed that of his enemy—the frightful havoc took place in the after pursuit, in which the Earl and Lord Stanley joined, while Sir William remained to pillage the field. It is not our purpose or desire, nor can we think it would be at all acceptable to the reader, to follow the earthly remains of the vanquished king, through the savage and unexampled degradation to which they were subjected, by a cruel and barbarian rabble—promoted, there is little reason to doubt, by his base and unprincipled successor. We therefore gladly close the scene. . . Autumn dig at Chirk Castle promises to be exciting…. It seems that during the medieval period, no fewer than five holders of Chirk Castle were executed for treason. With that track record, I trust the National Trust intends to tread very carefully when it looks into the castle’s past and secrets this autumn. Richard, Duke of Gloucester, also held Chirk for a while, so here we have yet another great castle with Ricardian connections. It belongs to the Myddleton family now, and has done since the end of the sixteenth century, and they still live in one of the towers. this young lady fared rather better than ‘a litelle madden that daunceth’ who received a mere £12 on the January 7th 1497 – but still, nice work if you can get it, considering that on June 8th ‘the maydens of Lambeth for a May’ received a measly 10s to share out between themselves. Henry’s enjoyment of watching dancing was just not limited to damsels and maidens for he also enjoyed Morris dancing – well if you can call it dancing – for on January 4th ‘for playing of the Mourice dance’ earned the participants £2. MUSIC – Another favourite way of whiling away the time for Henry. Numerous payments for ‘mynystrels’ are recorded including on February 4th 1492 including ‘a childe that played on the record’ received £1 and the ‘mynystrels that played in the Swan’ received 13s and 4d. Interestingly Richard III ‘s mother, Cicely Neville’s minstrels, received the sum of £1 and to ‘children for ‘singing in the gardyn’ at Canterbury 3s and 4d. BLING.. Henry evidently was a man who loved bling – paying out £3800 for ‘many precyous stones and riche perlis bought of Lambardes for the ‘garnyshing of salads, shapnes and helemytes’, 27th May 1492. Henry certainly had a thing for decorating his armour and helmets for in June 30th 1497 £10 was paid to the Queen to cover her costs of ‘garnyshing of a salet’. Now whether the Queens attempts were not up to scratch or perhaps she tired of the project for a few days later on August 9th John Vandelft, a jeweller was paid £38.1s.4d for the ‘garnyshing of a salett’. Was this the same salet, I know not, and how many salets would one man require? No doubt he looked a sight for sore eyes unfortunately no details survive of said salets however may they have looked something on these lines except more blingy..
or this…. or perhaps something more modest ? Your guess is as good as mine dear reader. Of course Henry liked jewellery in general and not just for adorning his armour. This would have been silly because it could have got damaged if he had found himself in the midst of a battle without a convenient pike wall to hide behind as well he would have stood out like a sore thumb but I digress… On June 12th 1495 a further payment of £2560 was made to ‘Lumbards’ for ‘diverse juels’. In June 1498 a payment of £2000 was paid for ‘Delivered and sent over the see for sertayn juels of gold, £2000’. On 30 July of the same year a further payment of £2648.9s ‘for sertayn jules bought in France’. However he was not always so extravagant paying out smaller sums now and again, for example, June 24th ‘for an ouch sett with Perle and stone £100’ and May 16 to Robert Wright for a ‘ring with a diamond £20’. Bray…from the same litter… these dogs predecessors liked nothing more than fawning around their Master..as dogs do. Henry loved his greyhounds so much so he would pay damages for any destruction caused by said pets…..hence on 13 March 1495, 4s was paid to ‘Rede for a colt that was slayn with the Kings greyhounds’. Details of greyhounds purchased include a payment of 14s 4d to ‘Cobbe of the stable for a grey hounde’. And ‘to the one that brought the king a whit greyhound from Brutan, £1’. Henry also liked birds, Popinjays are mentioned several times so they must have held a certain appeal for him paying ‘Richard Dekon for a popyngchey £6 13s 4d’ on 14th January 1498. A popinjay descended from Henry’s favourite bird who was known as Buck. Buck was not very bright but brightly coloured and flamboyant..
Henry, despite what his traducers say, did possess a sense of fair play. Yes he did. For example he paid out in February 27th 1495 , £15.19s for Sir William Stanley’s burial at Syon. This was as well as the £10 that was given to Sir William ‘at his execution’ on the 20th February. You cannot say fairer than that. It should also be remembered that he paid for a ‘tombe’ for King Richard III on the 11 August 1495, the not to be sneezed at amount of £10 1s. This was only a third of what had been paid to the young damoysel that daunced its true, but why be petty? On Dec 8th 1499 ‘Payed for the buriell of therle of Warwick by iiij bills, £12.18s 2d’. I can find no trace of a payment for the burial of Warbeck, perhaps he was simply cast in a hole or mass burial site (1). Henry could hardly have been expected to shell out for every traitors burial. Another misconception is that Henry was an indifferent and cold husband. This is not on. Perhaps he was merely cross having regularly to either pay off the Queens debts, mostly incurred through gambling or give her loans. On November 30th 1493 ‘delivered to Master Chaderton by thanks of William Hungate to pay the Quenes detts £1314 lls 6d’. He also lent her £100 at Shene on the 2 April 1494. A further £2000 was ‘delivered to the Queen’s grace for to pay her detts which has to be repayed’ on 1 February 1497. I should think so too!. And finally I would love to know what happened regarding the 6s 8d paid for ‘the burying of a man that was slayn in my Lady Grey Chamber’ 27th May 1495? (1) Perkin Warbeck’s body after it had been separated from its head, was taken to Austin Friars Church, where it was buried with ‘other gallow birds on the west side of the nave’ Perkin, a Story of Deception Ann Wroe p499. (Austin Friars Church was later destroyed by a bomb during the 2nd World War and hardly any traces remain save for a small garden area). Another myth about men “not breaking oaths to Richard”. . . .
Well, I’ve heard the tale of Sir Rhys ap Thomas hiding under a bridge for Henry to march over him on the way to Bosworth, thus not breaking Sir Rhys’s oath of loyalty to Richard, but this is a new one on me! 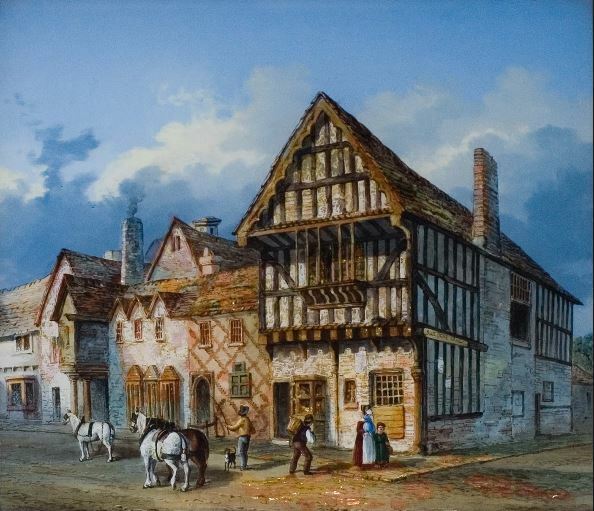 “. . .when Henry, now strengthened by Sir Rhys ap Thomas, and a contingent of men from North Wales, reached the town of Shrewsbury, to cross the Severn into England, the town gates were closed against him and the town bailiff, Thomas Mitton, announced that, as he had sworn allegiance to Richard, he could not allow Richmond to pass. 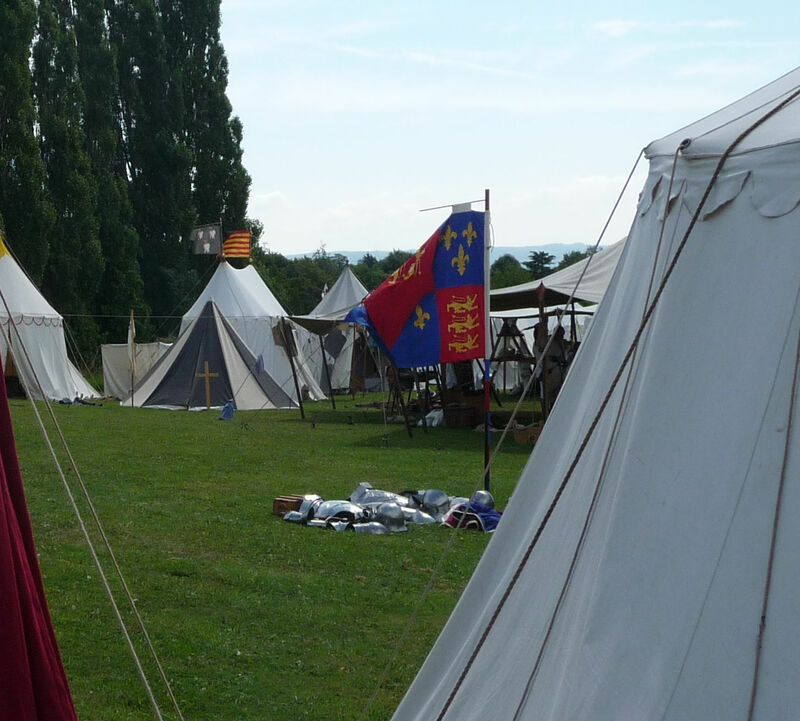 “The closure of the town of Gloucester to the Lancastrians in 1471, preventing the crossing of the Severn, had proved disastrous for them – would the same be the case for Henry at Shrewsbury? Henry assured the bailiff that he and his men would do no damage and that they would not interfere with his oath, but Mitton was adamant. “The next morning however, there was a change of heart. . .due to the intervention of Sir William Stanley. Traitors’ Gate, Shrewsbury town wall. Let’s hope it was the one Henry passed beneath! But the above site is not the original source for this story. There is an earlier one. Well, Henry was still some way from Bosworth, so I imagine there are a few more such myths waiting in the wings. They’ll be throwing their cloaks over puddles next! Or dropping their garters! Thomas Stanley, or, the man with the evil beard…. For anyone interested in knowing what made slippery Lord Stanley tick, here is an excellent evaluation, save that Sir William was executed for refusing to oppose “Perkin”, not for supporting him. The man was a born opportunist and survivor. Full stop. Oh, and he had an evil beard! 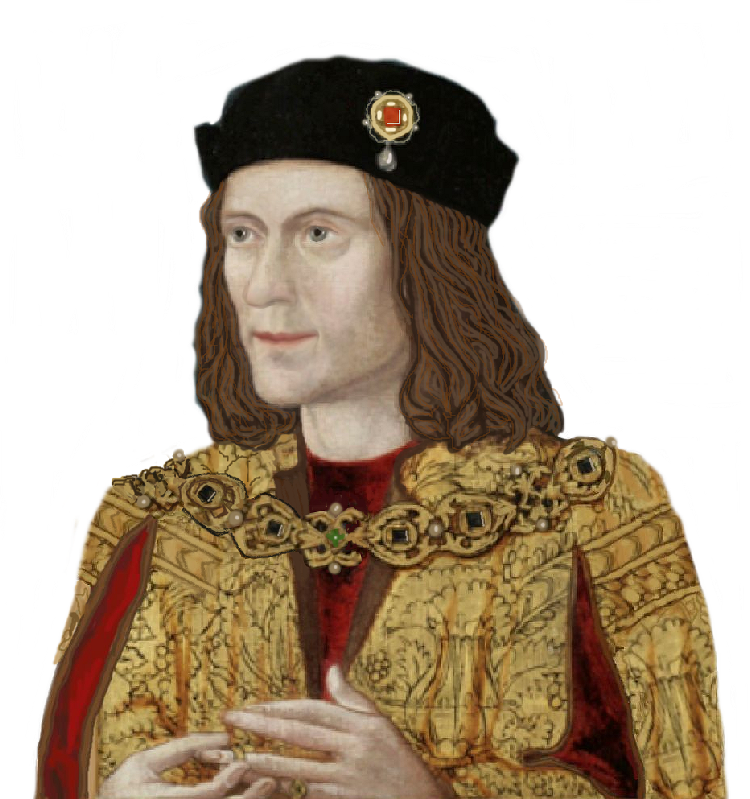 What if Henry VII had been good-looking and charming….? It occurred to me today that when it comes to being so very supportive of Richard III, we are helped (in a manner of speaking) by Henry Tudor being such a visual horror. Yes, truly. He was ugly inside and out. Loathsome. And his legacy of the House of Tudor was only brightened by Elizabeth I. The rest you can keep. Every last one of them. What a bunch. It’s difficult to picture, I know, but if Henry had been a handsome, delightful chap, what then? So, might later reaction to Henry Tudor have been different if he too were good-looking, a brave warrior, and a just man with charm aplenty? Let’s face it, not one of those adjectives could be applied to Henry, who even cowered at the back when it came to battles. He was a miserly liar, coward and cheat, a dull clerk and an accountant with a full set of claws, whom fate conspired to put on the throne. Because of him, we lost Richard III, who would have gone on to be one of our great kings. Oh, I make no bones about my totally biased and carved-in-stone judgement of both men. Henry even managed to die in his bed. How grossly unfair and unjust was that? He had overseen the hacking to death of the King of England, and had only been able to do that because Richard had been betrayed. Hm, Sir William Stanley sure as hell paid the price for that! No sympathy from me for him either. And I do know that the book from which the above illustration is taken is far from complimentary about Richard – who is portrayed as Shakespeare’s fictional monster. Henry, I believe, is portrayed as his true self! It’s hard, I know, but if you can just picture Henry as being more like Richard, would we still condemn him so savagely? Yes, we would. Perhaps not quite so savagely, but we’d still condemn him. He had no right to the throne, but stole it through treachery, without having any blood claim. It’s difficult to forgive that, but I still wonder if we’d be quite so vitriolic if the two men were a more balanced match? William “Waste-all” Berkeley, the lord who out-Stanleyed the Stanleys at Bosworth….! Here is the story of yet another lord who betrayed Richard III at Bosworth. Oh, but wait a moment, this one betrayed Henry Tudor as well, now there’s a feat! The man in question was William, eventually Marquess of Berkeley, but nicknamed “Waste-all”. He was 43 when he won the Battle of Nibley Green, which was fought on 20 March 1469 or 1470, depending upon which calendar one uses. The battle is famous now because it was the last to be fought in England by private feudal armies. William “was of an unusually haughty and headstrong disposition, and made himself so much feared by all around him that for several years before his father’s death none of the tenants would accept any lease without William’s joining in it”. Not an endearing character. He had an even more famous feud with Margaret Beauchamp, Countess of Shrewsbury (1404–14 June 1468) was the eldest daughter of the 13th Earl of Warwick, and by her marriage to the 1st Earl of Shrewsbury, as his second wife, she was the mother of Lady Eleanor Talbot, Sir Humphrey Talbot, and Lady Elizabeth Talbot, Duchess of Norfolk, all names Ricardians will know well. But by her first marriage, she was the grandmother of Thomas Talbot, 2nd Baron Lisle , 2nd Viscount Lisle (c.1449-20 March 1470), who was aged 20 or 21 at the time of Nibley Green. Margaret was a truly formidable woman who always fought tooth and claw what she considered to be hers and her children’s. She pursued years of feud with the equally formidable William Waste-all. They were “”two merciless natures not unevenly encountering”, as Smyth, the Berkeley family biographer and steward, recorded. The dispute was over manors and lands, including Berkeley Castle itself, which the Countess regarded as hers. Waste-all, needless to say, did not agree. One of the disputed manors was Wotton, not far from Berkeley, which Waste-all said the countess was occupying illegally. The dispute was not confined to legal means, including petitioning King Edward IV, but also by predatory attacks on each other’s territories, and fights between their servants and tenants. It was quite some quarrel, even by the standards of the day. Then, on 14 June 1468, the Countess Margaret died, and her estate—and the great dispute—passed to her grandson, the young Lord Lisle, who was eager to take up the cudgels. He plotted against Waste-all, using a treacherous Berkeley servant who then turned coat again and told Waste-all everything. The latter was monumentally furious. Lisle was livid. Letters were sent, threats made, and a challenge issued on 19 March 1469. The confrontation was set to take place the following day at Nibley Green, halfway between Wotton and Berkeley. Waste-all maintained a garrison at Berkeley Castle, which gave him an advantage over Lord Lisle. They faced each other at Nibley Green, 1000 men to 300 or so. It was an unequal conflict from the outset, and because his visor had not been lowered, hot-headed Lisle was shot with an arrow on the left side of his face. One of Waste-all’s supporters, named Black Will of the Forest of Dean, finished off the wounded man with a dagger. Lisle’s force fled, pursued by Waste-all’s. There was chaos as the latter and his great numbers descended on Wotton. Such was the ordeal for Lisle’s young wife, that sixteen days later she was brought to bed early of a stillborn son, thus ending her husband’s line. All this took place as Warwick the “Kingmaker” was turning upon Edward IV. A few months later, Edward himself was a fugitive and Warwick had returned the displaced Lancastrian, Henry VI, to the throne. Then, the following year, Edward IV returned to overthrow Warwick and Henry VI at the Battle of Barnet. On 6 October 1473, the case was settled in favour of Waste-all, who must have thought it was all done and dusted. However, he became mixed-up with Sir Edward Grey, brother-in-law (through her first husband) of Elizabeth Woodville, Edward IV’s manipulative queen. Grey married the sister of the late Lord Lisle of Nibley Green, and decided to take up the Lisle claim through his wife. William Waste-all was on shakier ground now, with Elizabeth Woodville obviously set on upholding her brother-in-law’s side of it. Edward IV was always one for a quiet time in his marriage – if marriage it was, considering he was first married to the old Countess’s daughter, Lady Eleanor Talbot, who selfishly stayed alive for four years after he’d uttered his vows to Elizabeth! Oh, tangled webs… In due course Sir Edward Grey would indeed be created Lord Lisle by Richard III. In the meantime, anxious to stay in favour with Edward IV, Waste-all had conveyed many manors and lands to the king’s younger son, the little Duke of York (soon to be one of the boys in the Tower). When Richard III came to the throne, and the Duke of York (and his elder brother, known as Edward V) were declared illegitimate because of the Eleanor Talbot marriage, everything returned to Waste-all. Did he dance a jig? Probably. But it was now that he really earned his nickname, Waste-all. After subsequently gaining 68 Mowbray manors and other property across the realm, he set about giving or granting everything away in order to gain honours and distinctions. 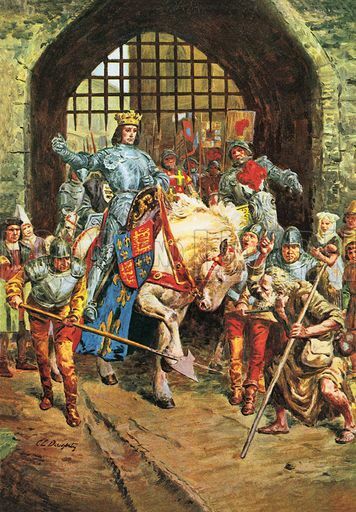 He conveyed 35 manors to Richard III, in return for the title Earl of Nottingham, and when Richard faced Henry Tudor at Bosworth, it was said that William Waste-all out-Stanleyed the Stanleys, by supporting one side with men, the other with money. Henry Tudor won, and returned the 35 manors to William Waste-all. Was fate hell-bent on helping the fellow? Next Waste-all conveyed two castles and 28 manors to Sir William Stanley, and then parted with many more to Sir William and others. In his will he entailed Berkeley Castle and all remaining family possession on the Tudor king, reserving only a life interest in them. In return he was created Marquess of Berkeley. He ended up as Great Mareschal of England, but by the time he died, on 14th February, 1492, he had disinherited his entire family. What a Valentine. Small wonder he gained the soubriquet Waste-all! But there is a postscript. Waste-all had no legitimate children, and so his heir was his younger brother, Maurice, whom Waste-all considered to have married beneath his rank and thus brought shame on the family. What nerve, considering his own antics. Was Waste-all giving everything away in order to punish Maurice, who eventually inherited the title, with nothing to go with it? If this is true, it was a terrible act of spite from nasty old Waste-all, who wasn’t exactly a dazzling adornment to the title of Berkeley. What am I talking about? The Stanley Knife. Jokes abound on certain medieval groups about these multi purpose knives being something that should have been invented by the two side-shifting, game-playing Stanley Bros of the 15thc…so I thought I would endeavour to find out if there was indeed a connection. A WILLIAM Stanley invented the Stanley Knife. No, not the one who Henry Tudor executed when he suggested Perkin Warbeck might be the ‘real deal’ but William Stanley, born in Islington in 1829. He was the son of a mechanic called John Stanley and was a descendant of Thomas Stanley–not THAT particular Thomas Stanley, but the one who wrote The History of Philosophy in the 17th c. Author-philosopher Stanley was the son of Sir Thomas Stanley of Cumberlow, who—and this is where it gets interesting—happened to be the grandson of yet another Thomas Stanley (they loved the name Thomas, those Stanleys! Doubting Thomases? ), an illegitimate son of Edward Stanley, third Earl of Derby. Edward Stanley was the son of Thomas Stanley (that name again!) the 2nd Earl, who was, in turn, the son of George Stanley…you might also know George as Lord Strange, who was held at Bosworth by Richard for the good behaviour of his father, THE Thomas Stanley. And so this leads us to George Stanley’s father, who was, of course, was Thomas the Trimmer, first Earl of Derby, step-father to Henry Tudor and husband of Margaret Beaufort–so yes, one could indeed say the Stanley Knife is connected to that slippery lord and his kin. I expect Lord Stanley would have approved. How did Henry VII find the tomb of King Arthur…? The following article is based on books by Chris Barber and David Pykitt, so I do not claim anything as my own work. The books are The Legacy of King Arthur and Journey to Avalon. It is also based on a third book by Chris Barber called King Arthur: The Mystery Unravelled, which contains more about Henry VII and King Arthur. 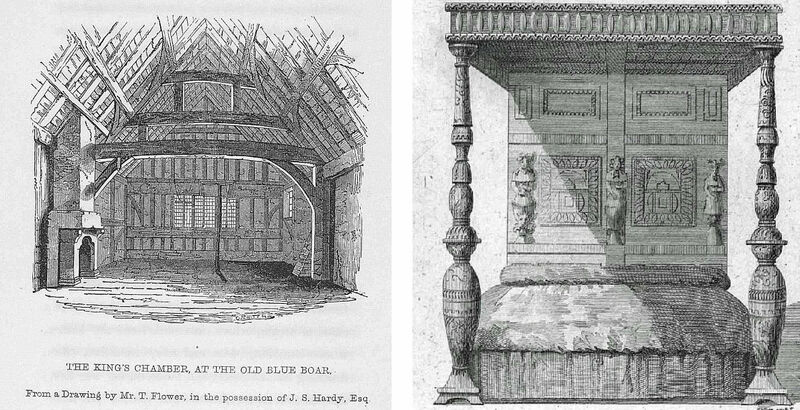 The illustration of St Armel’s tomb is also from one of the books, the rest I found by Googling. I recommend all three works as fascinating reads about the eternally fascinating King Arthur. According to the above authors, Henry VII knew that he was not only descended from King Arthur, but also the identity that the king assumed, and exactly where he was buried. These are astonishing claims, because to this day no one else really knows, so how come Henry VII was au fait with these astonishing details back in the 15th century? I mean, we all know how cunning and secretive Henry was, so he was quite capable of inventing it all, but the inference in the above books is that there was nothing invented at all. Henry was on the level. According to his lights. The thing about Arthur, has always been that when he was “mortally” wounded at his last battle, now thought to be Camlann (the whereabouts of which is not known), he just disappears. We have the story of Sir Bedivere having to be told three times to throw Excalibur into the water to the Lady of the Lake, and that’s…well, the end of it, really. He was last seen being taken away across water to be healed by magic of some sort. Of course, I’m referring to the later romances, not the real Arthur, who was a Dark Age war leader, but even so, the outcome is the same. No one knows what happened to him. Except for Henry Tudor, who, somehow, had all the facts. Henry was proud of his Welsh roots. At least, he was when he needed his countrymen’s help to usurp the throne of Richard III. After that, he didn’t do much for Wales or the Welsh…except decide to claim King Arthur for himself. Arthur being Welsh too, you understand. Well, that’s my opinion, but I know there are a lot of other theories about the who, where, what and why of the real Arthur. According to Barber and Pykitt, as far back as the eighteenth century, Arthur was known to be the hereditary leader of the Silures in South Wales, yet the vast majority of modern historians choose to ignore this, placing him anywhere and everywhere except South Wales. Oh, with a passing mention of Caerleon. Hmm, it must be a general failing of modern historians, to ignore obvious truths in order to feed a traditional obsession. An examination of early Welsh genealogies revealed to Barber and Pykitt that a misinterpretation by academics had mixed up two Arthurs. Gildas, the monk, mentions a charioteer belonging to someone known as “The Bear”. The Celtic word for bear is “arth”, and so it is possible that the name Arthur is a nickname derived from the title Arthwyr. Whatever, the result was that the Welsh Arthrwys, whose title was Arthwyr, to a later century, and thus detaching him from the Arthur of legend and history. Once this mistake was discovered and corrected, the authors were able to locate not only Arthur’s court, the sites of his most of his principal battles and the Isle of Avalon, but even his final resting place in Brittany. In Nennius’s Historia Brittonem Arthur is described as not only a military leader, but a religious one too, which brings me to another important point in the story. Now, apart from the Arthur we all know, there was also a soldier-saint named Arthmael (Bear Prince), or Armel. He is portrayed wearing armour—in his guise as “Miles Fortissimus” (Mighty Warrior). He liberated Brittany from the 6th-century tyranny of Marcus Conomorus. This soldier-saint is known to us now as St Armel (Feast Day tomorrow, 16th August), and his tomb can be seen to this day in Armel’s church at Ploërmel. The stone sarcophagus is empty now, but the identification of the saint’s resting place is definite. There is a gilded casket which is said to contain the saint’s jawbone. The church itself has been rebuilt on the site of the original church, and the tomb incorporated. Barber and Pykitt have concluded that after Arthur was deposed and apparently fatally wounded in England, he actually went into exile in Brittany—“Little Britain”, where so many of his countrymen were to be found. Thus arose the story of the Once and Future King, because Arthur didn’t die as such, he simply disappeared, leaving his fate unknown to his countrymen. They, of course, hoped he would return. Then, in Brittany, Arthur became St Armel, the Bear Prince, using all his warrior skills to lead the Bretons to freedom. Crucially, St Armel was also an exiled Welshman, and so Henry would certainly feel an affinity with him, if nothing else. Is this connection rather a great leap? Who can say? After all, the authors’ reasoning concerning so many names that contain “bear” in one form or another, seems perfectly logical. St Armel, a dragon-slayer like St George, was most certainly one of Henry VII’s favourite saints, appearing among the many saints in Henry’s amazing chapel in Westminster Abbey. And Henry, in his determination to establish his links to Arthur, made sure that his firstborn son was not only born in Winchester, but also christened with the name Arthur. Winchester was the ancient capital of the Kings of Britain, and believed (by Malory) to be the site of Camelot. Whether Henry VII agreed with the latter is debatable. After all, surely he’d have preferred Camelot to be somewhere in Wales. But what the heck, in the 15th century Winchester was where it was at, as the saying goes. It had even possessed the famous Round Table since the time of Edward I. The table that hangs in Winchester was painted as we know it now by Henry VIII, and so after Henry VII would have known it in its green-and-white guise. It all went awry, of course, because young Arthur, heir to the throne of England, died before his father. So there wasn’t a second King Arthur, just another Henry. And what a Henry. Say no more. Please. There is a lot of extra detail and explanation in the books, both of which are well worth reading. When Henry and his uncle, Jasper Tudor, fled from Britain in 1471, he believed that he was saved from shipwreck off the coast of Brittany by none other than St Armel. The dragon-slaying Welsh saint always featured prominently throughout Henry’s life, and is represented in his chapel (more a cathedral) at Westminster Abbey. If nothing else, Henry was a sharp cookie, and quite capable of putting two and two together to make a total that might be true and that definitely suited him. He would have heard the local tales and memories, so maybe—just maybe—he drew the same conclusions that Barber and Pykitt would all these centuries later, to wit, that the saint and King Arthur were one and the same. We’ll never know the truth, of course. But one thing we can be sure of with Henry, he went out of his way to claim descent from Arthur, and brandished this claim at every opportunity. His purpose was to imprint the belief that his occupation of the throne was justified. Which it certainly wasn’t, except by conquest. His lineage was, if anything, a hindrance. He had no right to the crown of England, and only won at Bosworth through a fluke (by the name of Sir William Stanley). Were it not for “Judas” Stanley, Henry and his grand Arthurian claims would have been consigned to history. Hardly remembered at all, in fact. A mere footnote – as the loser on 22nd August 1485. Richard, the Stanleys and the Harringtons…. Well, I always knew the Stanley brothers were sh-1-ts (yes, I’m being relatively polite – that is a 1 not an i) and this article (link below) confirms my opinion. No doubt a lot of you will already know the story of the Harringtons’ struggle against the thieving self-interest of the Stanley brothers, Thomas and William, who wanted everything, especially the Harringtons’ seat of Hornby Castle in Lancashire. But Edward IV intervened and settled in favour of the Stanleys, presumably because he wanted their support. He granted Thomas Stanley the custody and marriages of the two Harrington heiresses. So Richard wasn’t able to save the family from the Stanleys, but it certainly aroused the latter’s ire. Many of you will also have read this 2010 article or Hipshon’s book, but in case you haven’t, it is very informative. This bitter quarrel, and Richard’s support for the Harringtons, which was renewed when he became king, probably is behind the treachery at Bosworth. Nothing to do with Henry Tudor and Margaret Beaufort, but everything to do with an overwhelming desire to be avenged on Richard for backing the Harringtons. The Stanleys bore an almighty grudge, but hid it behind apparent new allegiance to Henry Tudor. My opinion, of course. Footnote: The events described above, i.e. Richard coming out in favour of the Harringtons in the 1460s, came to a head only a week or so after an earlier instance of Thomas Stanley’s propensity for treachery against England’s reigning king, this time Edward IV, and it was Richard who exposed him. Edward must have regretted deciding in Stanley’s favour. I will describe it all in an article scheduled for the day after tomorrow.